The EdCan Network is pleased to honour Sandra Becker – third-year Ph.D. candidate at the University of Calgary’s Werklund School of Education – as the first-ever Master’s-level category recipient of the Pat Clifford Award for Early Career Research in Education in recognition of her exceptional leadership in addressing evidence gaps on Makerspaces as drivers of both teacher and student engagement. Leveraging her 33 years of experience as a former classroom teacher and teacher librarian in Alberta, Becker collaborated with fellow educators to transition a school library into a learning commons equipped with a Makerspace. Through this experience, it became apparent the empowering impact this had on teacher and student learning – but also the one-off and add-on nature of Makerspace clubs and projects that remained separate from the curriculum. As a doctoral student, Sandra Becker has since mobilized research nationally and internationally on integrating Makerspaces into complex school settings, with the goal of creating a widely-adopted Makerspace implementation and assessment framework that has the potential to embed Makerspaces into K-12 core subjects – including science, math, social studies, and language arts – while positioning teachers as designers of learning. Third-year Ph.D. candidate, Sandra Becker (left), is the Master’s-level category recipient of the 2018 Pat Clifford Award for Early Career Research in Education. 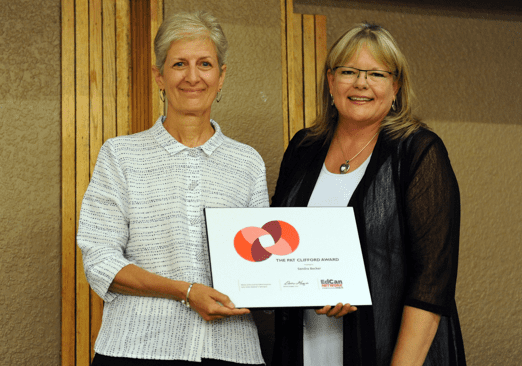 The award was presented by her Doctoral Supervisor, Dr. Michele Jacobsen (right), Vice-Dean of the University of Calgary’s Werklund School of Education and Member of the EdCan Awards Committee. As co-investigator of “How can I build a model if I don’t know the answer to the question?”: Developing teacher and sky scientist ontologies through making, recently submitted for publication, Sandra Becker boldly and successfully collaborated with a Grade 6 teacher to design, implement, and reflect on a sky science Makerspace project that enhanced students’ abilities to develop their own questions, build models to answer those questions, and embody the role of scientists. The study further highlights substantial insights for teachers in gaining a deep understanding of how their students learn, in addition to empowering teachers to adapt their teaching practice accordingly while designing innovative learning experiences. Becker is also collaborating as part of the same research project to explore how teachers move between “two worlds” – the traditional schooling approach of curricular outcomes and provincial exams, and the innovative approach to school that is hands-on and student-driven. 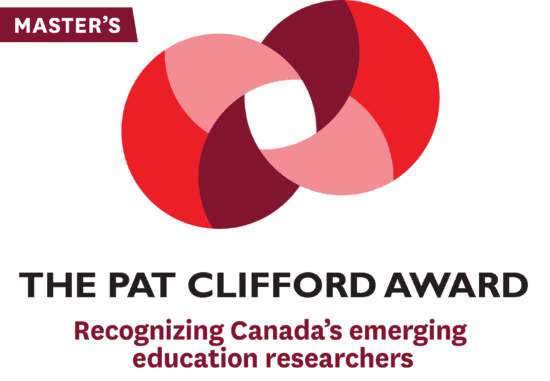 The Pat Clifford Award Selection Committee lauded the timeliness and originality of Sandra Becker’s work, including her strong commitment to community engagement and knowledge mobilization. Becker, S., Ko, G., Czuy, K., Groen, J., Kim, M., & Roy, S. (Forthcoming). “Like bubbles floating on the surface”: Reflections on transcultural doctoral seminar participation. Journal of Educational Thought. Becker, S. & Jacobsen, M. “How can I build a model if I don’t know the answer to the question?”: Developing student and teacher sky scientist ontologies through making. (Under review). Journal of Science and Mathematics Education 2019 Special Issue on Maker-centred Science and Mathematics Education: Learning, Teaching and Environment Design. Becker, S. & Yin, M. Y. (Forthcoming). A tale of two scholars: Developing transculturally through dialogue and writing. Emerging Perspectives. Dressler, R., Becker, S., Kawalilak, C., & Arthur, N. (Forthcoming). The crosscultural reflection model for post-sojourn debriefing. Reflective Practice. Arthur, N., Becker, S., Crossman, K., Dressler, R., & Kawalilak, C. (Under review). Pre-service teachers and study abroad experiences: Don’t forget about them when they come home. Teaching and Teacher Education.